When designing the new Whole Foods location in Bridgewater, N.J., the company created an expansive produce department and carved out space for something a bit different: a mushroom farm. The farms are the creation of Smallhold, a new company out of Brooklyn, N.Y. The company’s mini farms can be found in a handful of restaurants, but Whole Foods is the first retail partner. The farm in the Bridgewater location will produce about 120 pounds of mushrooms every week, but the farms can be much smaller depending on need, said Adam DeMartino, co-founder and COO of Smallhold. “Essentially, we need as little as 4 feet by 2 feet square footage,” he said. “It depends on how much you're going to sell.” Whole Foods hopes to install another farm in one of the company’s Brooklyn locations later this year. Logistically, the mushrooms are initially grown in nearby farms, including one run by Smallhold, and brought to the mini farm during the last stage of growth. Once the mushrooms are ready, a store or Smallhold employee bags the mushrooms and puts them on nearby shelves where customers can grab them. Smallhold’s technology monitors the environment and gathers data on temperature and humidity. The company can also gather market data and see which mushrooms are selling. At the Whole Foods location in New Jersey, the farm is growing three different kinds of oyster mushrooms – yellow, blue and pink. 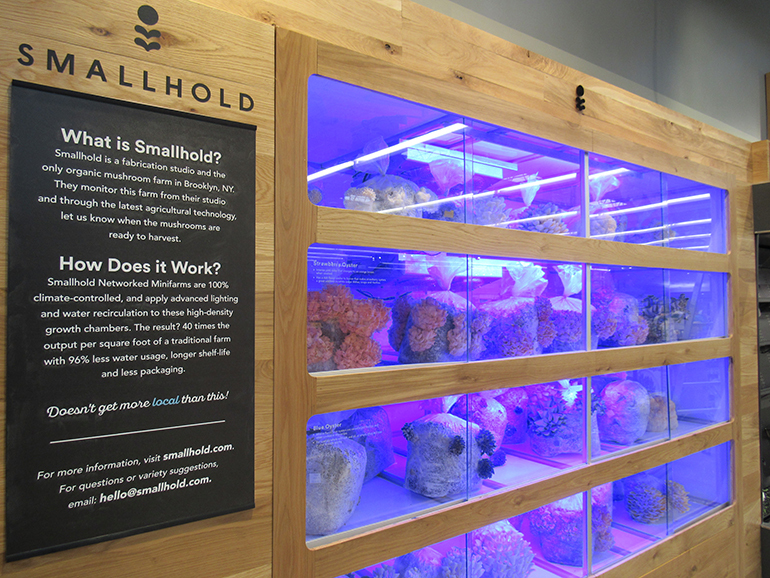 Smallhold started with mushrooms, in part, because “we looked for high-margin, high-output crops, and mushrooms were the natural ones to land on,” said DeMartino. 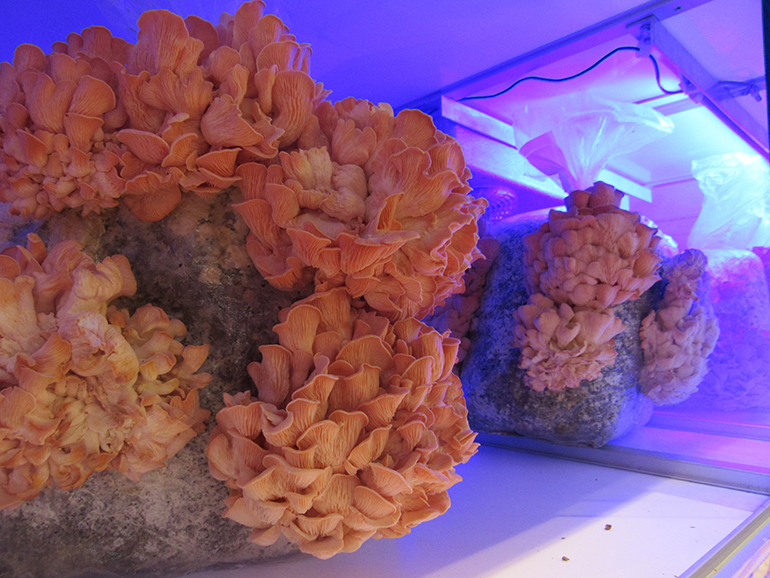 Mushrooms are also tricky to transport and have a short shelf life, both problems the mini farms eliminate. These benefits afford retailers the ability to price their mushrooms at a lower price per pound, DeMartino said. DeMartino said the company plans to expand to other retail locations and beyond.